We were a motley crew of Gaelic football misfits, but we loved to play and we took fierce pride in the jersey. Some of us, like myself, who had represented Renvyle at Junior A level for close to twenty years were now considered to be past our sell by date and had just recently received our P45s Others had aspirations of graduating to Junior A but would be forever destined to dwell in Division 5. A few more would ultimately move up the ranks but not for another year or two and the remainder shouldn’t have been with us at all, but for reasons best known to themselves, they had lost the party whip within the ranks of the Junior A party. Our mixed grill had been assiduously assembled by Player/Manager Johnny Salmon along with his trusted lieutenants Jason Walsh and Michael Mullen. We were the Renvyle Junior Cs of 2004 and we were determined to make an impact. Sailors Beach with Mweelrea in the background. Photo courtesy of Padraig Lydon. 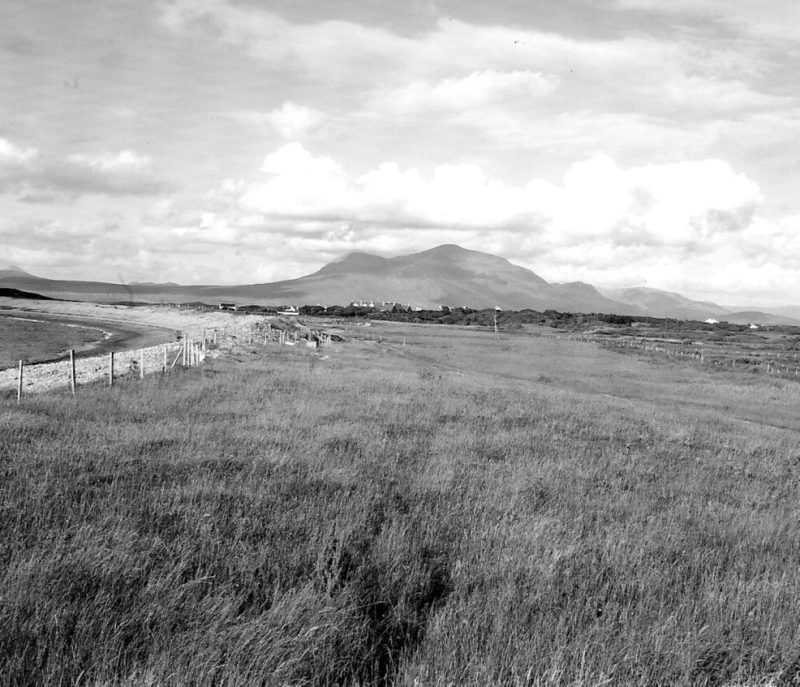 We trained initially on Glassilllaun beach and subsequently on the Community Sportsfield in Tullycross with the Junior As but things didn’t work out between the respective management teams so the Junior Cs switched to Pakie Sailor’s Beach, the spiritual home of Renvyle football. Pakie’s son and Renvyle legend, James Flaherty graciously granted us permission to tread the hallowed turf for the first time since 1986 when he, myself and the rest of the Renvyle Junior A squad trained like dogs three nights a week for the mother of all West Board Championship finals against the auld enemy. My recollection of Johnny Kane’s physical fitness sessions that summer was very vivid and the place had left an indelible mark on me. Eighteen years on, the playing surface had narrowed considerably due to coastal erosion but for me, the combination of factors that created the magic was still there to be embraced and appreciated. These included the stunning coastal location, the natural ground where the bounce of the ball was guaranteed, the ghosts of Renvyle’s footballing past, the sense of history and more than anything else, the continuance of a proud tradition that goes back to my great grandfather’s time. The Sailor’s experience seemed to give a lot of the lads a new lease of life and many of them rediscovered their love and appetite for the beautiful game. Due to the fact that the stretch of ground was narrow, the training games were fast and seven-a-side like in character. Wind was usually a big factor with an errant shot inevitably resulting in a time consuming trek across the durling stones on the sea side or into the swamp on the south side. The lads became acutely tuned into all of the above and because nobody wanted to stop the flow of the game with a misdirected pass or a wayward kick the quality of football and the decision-making process therein, improved out of all proportion within a very short space of time. A close band developed within the group and there was great heart and unity of purpose in all our footballing endeavours. On a personal level, I felt like I’d travelled back to the mid eighties in a time machine. Those years were heady days for Renvyle football, characterised by high numbers at training and a positive motivating atmosphere. Tullycross pitch was a happy, vibrant place to be at that time and I could see that our management team was intent on recreating this experience all over again. Paul Gannon is a native of the townland of Derryherbert and a permanent resident of the townland of Cloonluane on the Renvyle Peninsula, in the Parish of Letterfrack-Ballinakill.